In February 2016 I organized a cookery course for the first time in nearly ten years, with members of the re-enactment group Het Woud der Verwachting (litt: ‘the forest of expectation’, after a historical novel by the Dutch author Hella Haasse). The menu was in concordance with the date of the course: the first Saturday after Ash Wednesday. All recipes were dishes for Lent: no meat but lots and lots of fish. One of the fish I chose was pickle herring, but I had to go through a lot of trouble to obtain them. Thanks to the fish company Ouwehand in the coastal village Katwijk I finally obtained a bucket full of pickle herring. The Dutch pekelharing or pickle herring is salted herring. There are two different kinds: mature (adult) herring that has been put in salt for at least three weeks without removing the intestines (so, without gibbing), which is called steurharing, and the young, gibbed and mildly salted maatjesharing. The term pickle herring is generally not used for maatjesharing. Pickle herring is NOT the same as old maatjesharing (soused herring) or ‘green herring’. Because the steur herring is adult and not emptied before curing, they often contain roe or milt, which are both considered delicacies by some people. Serve them along with the herring. On this page, when I speak of pickle herring, I mean steur herring. Maatjesharing or soused herring has been frozen for at least 24 hours to kill the herring worm (Anisakis simplex). The fish is not yet fully mature and smaller than pickle herring. Because the herring worm will not survive three weeks in brine, the pickled fish can be eaten safely, even when still uncooked. Before serving pickle herring, the fish must be desalted. Submerge the fish in cold water that has to be refreshed every six or eight hours. Keep the bowl with the herrings in the refrigerator. When the fish is desalted, it will feel as supple as fresh fish. Then you can clean it (see below). When it is still too salty, it will feel more firm. When you buy whole pickle herring in brine, you can keep it for at least a year in the refrigerator, as long as the fish stays submerged in the brine. Pickle herring, once a national food, is barely eaten anymore by the Dutch public. They do not even know what it is, and think it is just old maatjesharing. Most pickle herring are now shipped abroad, to Eastern Europe. There the herring is fried or cooked after cleaning and desalting. Adriaen Coenen (1514-1587) was a Dutch fish trader who lived in Scheveningen, near The Hague. He collected all kinds of knowledge to do with his trade (sea creatures), but also a wide variety of stuffed fish and other objects with which he was present on fairs. People could see his collection for an admission fee. He wrote his knowledge down in manuscripts which he illustrated himself. Two of these have been preserved: the Visboeck (Book of fish) and the Walvisboeck (Book of whales). The Visboeck is at the Royal Library in The Hague (with a beautiful online reproduction in high resolution), the Walvisboeck is in the library of the Royal Society of Zoology in Antwerp, Belgium. There was a second version of the Visboeck that Coenen presented to the Prince of Orange but that manuscript has been lost. Coenen traded in fish, but he was not a herring trader, that was a separate occupation. However, he clearly loved herring: fresh herring (really fresh, or did he mean soused herring?) is delicious he writes, but it is only consumed be people living along the sea coast. 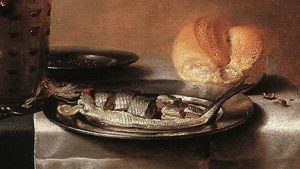 According to sixteenth-century physicians and scientists fresh herring is not healthy food, but Coenen disagrees. If herring was hazardous to your health, God would never have made it taste so good! Still, the contemporary physicians were right: the herring worm that is already mentioned above could make people very sick. But once more: pickle herring is safe to eat. 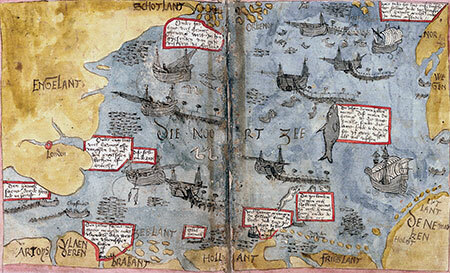 The picture shows a map of the North Sea from the Visboeck where you can see where the shoals of herring can be found. The North is to the right. ‘Hollant’ is on the bottom, England in the upper left corner. According to Coenen, pickle herring is good food for ‘den arbeits man’ (the labourer), especially when eaten raw with onions. But in other countries pickle herring is always cooked or fried before eating. In my book Het verleden op je bord (The past on a plate) I have presented a recipe from the seventeenth-century French cook François la Varenne on the preparation of this fish. Coenen also mentions that, just like today, foreigners observe Dutch eaters of uncooked herring with admiration tinged with horror. Below is a conversation that Coenen wrote down in his Visboeck. It took place in Rome. Protagonists are Jacob Duist, a Dutch doctor in canon law, and an Italian nobleman. The subject: eating raw herring. Once a year the Dutch and Flemish ‘expats’ in Rome received casks of pickle herring and dried herring that were send by a boat from Flanders. Jacob Duist had also received a cask, and was enjoying his herring on the street in front of his Roman domicile. “Haha, if you eat raw fish, you will be dead tomorrow!” He (the Italian) said. And he said and asked from what country he was. And the next day this nobleman sent his servant to see whether the man who had eaten the raw fish was not dead. And so it is that in some countries and by some people there is great wonderment about raw pickled or salted herring, which we consider good food. It is essential to thoroughly desalt pickle herring, otherwise the fish is really very salty. It makes a person thirsty. The fish was even used as a means of torture. In the Vaderlandsche historie (National history, Vol.7, 1752) the author Jan Wagenaar describes an event from 1575: a group of vagabonds were arrested in the city of Alkmaar and accused of espionage and treason (the Dutch Republic was at war with Spain that occupied large parts of the country). The tramps were horribly tortured, put on the rack, whipped and scorched “until they were black as coals”. Afterwards they were left to themselves for a couple of nights in a cell on the cold, hard floor. They got nothing to eat except pickle herring and other salted food, and nothing to drink no matter how much they begged for it. The torture continues, but I will spare you further details. Sir Picklehering was a popular figure in seventeenth-century stage plays. Rudolf Cordes describes in his dissertation (see bibliography) on play writer Jan Zoet from Amsterdam how this role was introduced in the Dutch Republic and Germany by John Green’s travelling stage group from England. 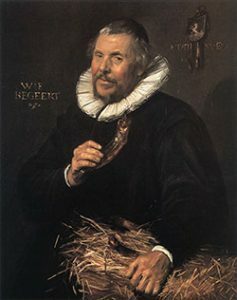 According to Cordes, the name Picklehering was borrowed by the English from the Dutch, especially from rhetorician Pieter Cornelisz. van der Morsch. In the portait from Frans Hals on the left, Van der Morsch is holding a red herring. The Picklehering on stage is an amalgam of the devil, the Shakespearean Fool and the German Hansworst (John Alexander, see bibliography) who comments on the happenings on the stage with critical and comical asides. 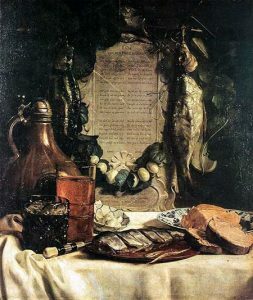 The still life painting Ode to the herring by Joseph de Bray from 1656 containing a poem by his uncle Jacob Westerbaen at the top of this page is well known. But the manner in which the pickle herring is being presented on that painting is not the most interesting one. There are other still life paintings that show the pickle herring presented in a more interesting way. That manner of serving the fish is described below. By the way, it is clear that it is mature pickle herring in the paintings by the roe or milt that is shown along with the fish. I have experimented with preparing the herring in the same manner as presented in many still lifes. That is different from how it is done today, but it is not difficult to do. So this time there is no recipe, but instructions on how to prepare pickle herring the old way. Breakfast dish or first course; preparation in advance 1 to 2 days; preparation 5 minutes (sfter practising; he first ones will probably take longer). Pickle herring straight from the brine feels stiff, you can not bend the fish. Submerge the herring in fresh water which you refresh every six to eight hours. Keep it in the refrigerator. I can’t tell you how long the desalting will take, it depends on how salt it was to begin with. A good indication that the herring is ready for further use, is when it feels supple as fresh fish. My pickle herring needed more than twelve hours, they were ready after 24 to 30 hours. Rinse the herring under the running tap, and put it on a cutting board. Lift the dorsal fin of the herring and remove it, cutting with scissors from tail to head. Using a sharp knife, cut off the head but leave it connected to the body on the underside by a strip of ½ inch (1 centimetre). Do the same at the tail-end of the fish. Now remove the body by making an incision in the belly very carefully from the head to the tail on one side of the fish. Take care not to cut deeper than the skin, because then you will damage the roe or milt. Flip the fish on the other side, and make the same incision. Head and tail will stay connected by the strip of meat from the belly. Carefully remove the roe (fish eggs) or milt (fish sperm) from the belly. Both roe and milt consist of two long strips that can fall apart easily. Now remove the body from the fish. Keep the head-strip-tail, whilst retaining its shape, on a dish in the refrigerator, along with the strips of roe or milt. Rinse the body and pat it dry. Lay the body on its back and spread it open. Loosen the small fish bones from the meat with a sharp pointed knife. Then carefully pull up the fish spine. Take care that both sides of the fish remain connected while removing the fish bones. Remove any stray small fish bones with a tweezer. Very small bones are harmless. Close the fish body and cut it in five thick slices. 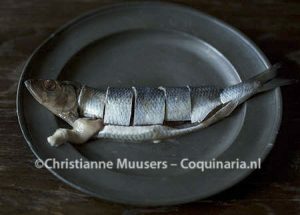 This is different from traditional Dutch soused herring which is prepared as two long filets. Arrange the head-strip-tail on a serving dish and put the five slices back where they belong so that the herring looks ‘whole’ again. Arrange the roe or milt as shown on the picture. 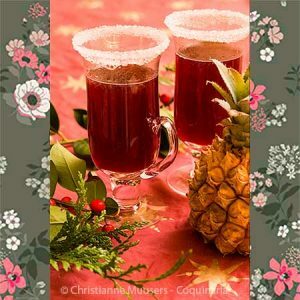 Serve slightly chilled but not refrigerator-cold, with chopped onion and – if you want – some mustard. 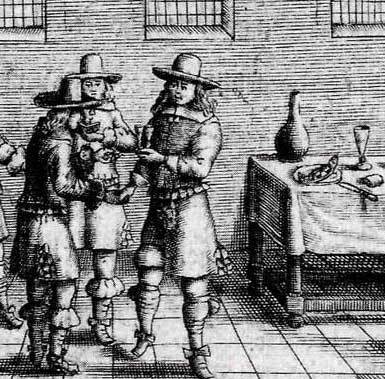 In the middle of the seventeenth century there was a popular drinking song that was called ‘Drinking Song on the Pickle Herring’. 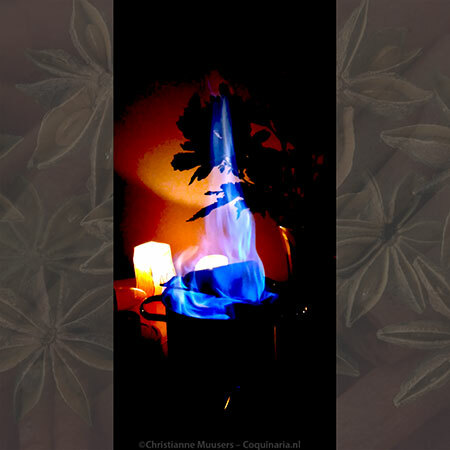 Frans Mensonides wrote an interesting article on this song. The page is in Dutch, use Google translate for a (not perfect) translation. The song is from a songbook from the middle of the seventeenth century, the illustration shown on the left is from another songbook, De Nieuwe Haagsche Nachtegaal : Vol van de nieuwste deunen en aartigste zangen (‘The new nightingale from The Hague, with the newest songs and melodies’, Amsterdam, 1659). Three men are playing the game, the pickle herring is on a dish on a corner of the table. There is an obsolete Dutch saying which compares conceited persons harbouring an inflated self image to the pickle herring: “Hij steekt een borst op als een pekelharing”, (‘He puffs up his chest like a pickle herring’). And indeed, before cleaning, the pickle herring has a rather thick belly. In a Dutch book with proverbs from 1726, De oorsprong en uitlegging van dagelyks gebruikte Nederduitsche spreekwoorden (‘The origin and explanation of daily used Dutch proverbs’) this saying is pared with another culinary saying that carries the same meaning: ‘Mouse droppings who call themselves peppercorns’. John Alexander, ‘The Dutch connection: on the social origins of the picklehering’. In: Neophilologus 87 (2003) vol.4, pp. 597-604. Adriaen Coenensz van Schilperoort, Visboeck (Fish Book). Manuscript in the Royal Library, The Hague (online!). Florike Egmond, Het visboek. De wereld volgens Adriaen Coenen 1514-1587. (The Fish Book. The world according to Adriaen Coenen) Walburgpers, 2005. Jan Wagenaar, Vaderlandsche historie. (History of the Netherlands) Vol. 7, Isaac Tirion, Amsterdam, 1752. (the horrible torture).